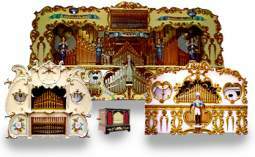 Shop 4 Music Boxes is the online store of the family business Dean Organ Builders, located in Whitchurch village just outside of Bristol. The company specialise in the manufacture, sale, repair and service of mechanical organs and the sale of music boxes and musical jewellery boxes from The Music Box Shop our retail music box store, music boxes and music box gifts can also be purchased direct on line at Shop 4 Music Boxes. We also have a traditional retail music shop “The Music Box Shop” in the centre of Whitchurch village which offers all types of musical instruments and accessories combined with a vast array of musical gift products in particular the shop specialises in quality musical boxes and musical jewellery boxes. We also have a small cafe in the shop so you can enjoy a beverage and a cake whilst browsing our musical boxes and jewellery boxes. Our products can be purchased by visiting the retail shop or direct online from “Shop 4 Music Boxes”. All mechanical organs are made specifically to order so please ring should you wish to discuss a requirement.